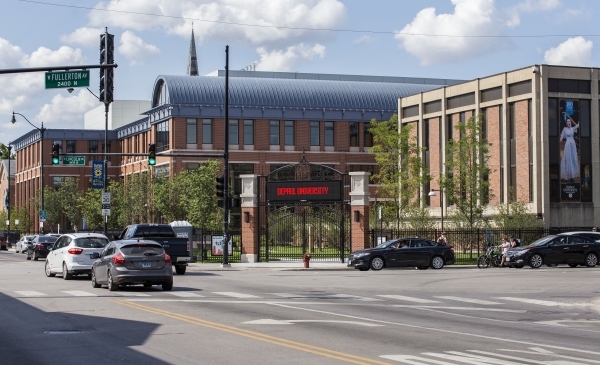 DePaul University’s Lincoln Park Campus has a new entrance at the corner of Fullerton Avenue and Halsted Street. A neoclassical gateway and pocket park adjacent to the School of Music Holtschneider Performance Center welcome students and visitors to campus, while giving pedestrians and bus commuters additional sidewalk space. The black iron gateway supported by brick and stone piers replaces a kiosk, campus map and brick benches that abutted the sidewalks. Nestled in the top part of the gate is an LED screen that will announce university messages and School of Music performances. 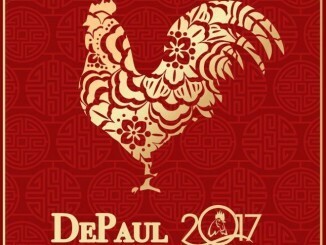 The idea for the new look was suggested by Chicago Alderman Michele Smith, whose 43rd Ward includes the DePaul Lincoln Park Campus. “Alderman Smith approached the university with a request to consider enhancing and updating the look of the corner, while at the same time providing more sidewalk space for people waiting for the bus,” said Jeff Bethke, DePaul’s executive vice president. 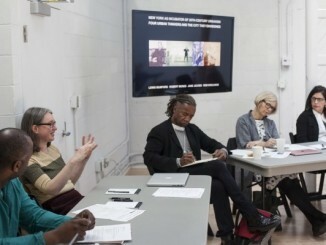 “We took her thought, previewed the idea with neighborhood organizations, which provided positive feedback, and then ran with it, thinking that now would be a great time given the completion of the Holtschneider Performance Center,” Bethke said. Named for the university’s most recent former president — the Rev. Dennis H. Holtschneider, C.M. — the Holtschneider Performance Center is a 185,000-square-foot venue in DePaul’s School of Music that is set to open for classes and concerts this fall. “The gateway makes a wonderful architectural statement at the east end of campus and opens up sightlines to the magnificent new performance center. It provides a new, welcoming entryway to our campus,” Bethke added. Chicago architect Joseph Antunovich personally designed the gateway. “What I wanted to do was integrate elements of today’s technology with the character, spirit and elegance of the neighborhood,” he said. “The details in the gate are found in many of the marvelous buildings that surround the DePaul Lincoln Park Campus. This is a historic neighborhood. The black iron, the neoclassic architecture, and brick and stone pillars were so prevalent in Chicago 100 years ago,” said Antunovich, president of Antunovich Associates, which designed the Holtschneider Performance Center. “Architecturally, it holds together as an element that says ‘welcome’ with echoes to the past,” he added.